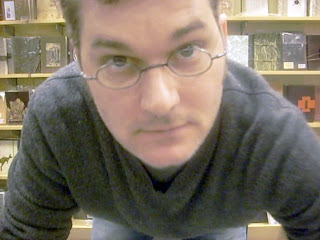 So I and about 200 of my closest friends whom I have never met got up close and personal with Mo Willems this weekend. I got there about ten minutes late because who knew it would take me 15 minutes to walk across the mall after parking on the wrong side. (No kidding, I was in the back of the parking structure on the opposite side of the mall.) So I had to dodge heads to see Mo read. Seriously, can you even see him in this picture? It could have been some crazy homeless person pretending to be Mo and I wouldn't have known the difference. Then there was a little problem with the signing line. I had called almost a week before the event to find out if I needed a ticket, and I was told I didn't. So, shocker, I didn't pre-order a book or get a ticket. Come to find out, I did need a ticket, which meant I was number 110 by the time I got there. 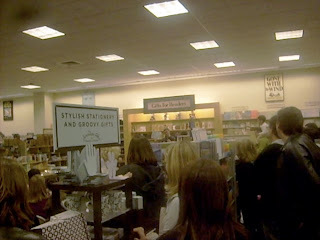 And seeing those stacks of books moms and kids brought in wheelbarrows, I thought I wouldn't be able to get my books signed before they had to take Mo to the hospital with acute author-signing-itous. No fear, I finally made it to the front of the line. I had four books to get signed, including Mo's newest, Naked Mole Rat Gets Dressed. Because I didn't have any kids with me, Mo asked, "Oh, are these books for your nieces?" I thought about telling him yes. Then I though about being honest and saying, "No, I'm just totally obsessed with you and a little in love with you even though you're married and we've never met but I couldn't wait to meet you and will you sign my arm because I will never wash it and treasure it more than anything." I figured that might freak him out a little, so I settled for, "No, I just love your work, and one of the books is for a little girl who couldn't be here today." Then I got a lot closer to Mo than I even imaged. For a second, I thought I might need to get a restraining order. But I realized he just wanted to send a personal message to the little girl who couldn't be there. Funny guy, that Mo. The signed copy of Leonardo the Terrible Monster and DVD that includes a personal message from Mo will be very loved by a certain family in Boise who can no longer travel because of a sick little girl. Seriously, Mo, you made my day. I know you were signing books for hours and probably miss your family while you are away on tour, but it was nice to meet you.